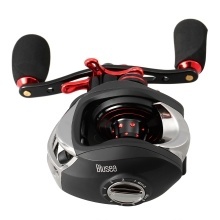 This baitcasting fishing reel features 11 + 1 anti-corrosion ball bearings 7.0:1 high speed line retrieve, 9-level magnetic braking system to provide smooth casting and best fishing performance. With lightweight body and comfortable EVA knob, you&apos;ll feel much less fatigue while fishing. It is dual-colored (Black & Red), making it a perfect gift for collectors and anglers. 11 + 1 stainless steel ball bearings for smooth casting, retrieve and corrosion-resistance. Two-color anodized aluminum spool guarantees maximum strength at minimal weight. Gear ratio: 7.0:1, high speed and super silent to offer extraordinary performance. 9-level magnetic braking system delivers superior castability and accomodates various lures. Aluminum bent handle and comfortable EVA knobs provide ergonomic nonslip grip. Pull&turn button allows you to remove the side plate for easy maintenance. Comes with a storage sack for convenient carrying.